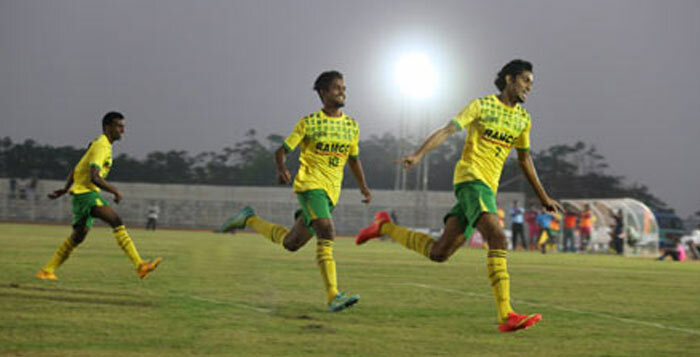 Rahul V. Raj will lead a 20-member strong Kerala squad in the South Zone Santosh Trophy qualifiers in Bengaluru which are scheduled to be held from 18th January, 2018. Midfielder S. Seesan will act as Rahul's deputy during the qualifiers. There are as many as 13 new faces in the team, including five U-21 players. India's FIFA U-17 World Cup star Rahul KP has also earned a call-up to the squad. Satheevan Balan, the former India junior coach, will coach the Kerala side. Introduced in 1941, the Santosh Trophy is an association football competition in which the regional state associations and government institutions under the All India Football Federation (AIFF) take part. It is one of the most prestigious domestic competitions in Indian football. Kerala are five-time winners, having won the trophy for the first time in 1973-74. Kerala have been grouped alongside Andhra Pradesh, Tamil Nadu and Andaman & Nicobar Islands in Pool B of the South Zone qualifiers. Squad: Rahul V. Raj (captain), S. Seesan (vice-captain), V. Midhun, S.H. Ajmal, Y.P. Mohammed Shareef, Vibin Thomas, V.G. Sreerag, K.O. Jiyad Hassan, Justin George, K.P. Rahul, V.S. Sreekuttan, M.S. Jithin, Muhammed Parakkotil, G. Jithin, B.L. Shamnaz, Sajith Poulose, V.K. Afdal, Anurag. Coach: Satheevan Balan; Assistant coach: Bejesh Ben; Physio: Arun S.Manoj; Manager: C.C. Asif. Kerala are supposed to play a few practice matches against Central Excise and ISL club Kerala Blasters in Kochi before leaving for Bengaluru on 14th January, 2018. January 22: Kerala v Tamil Nadu. In Satheevan Balan, Kerala has a very dynamic coach who knows how to bring out the best in his players. On top of that, the inclusion of as many as five U-21 players shows how Kerala is focusing on grooming the youngsters for upcoming challenges.